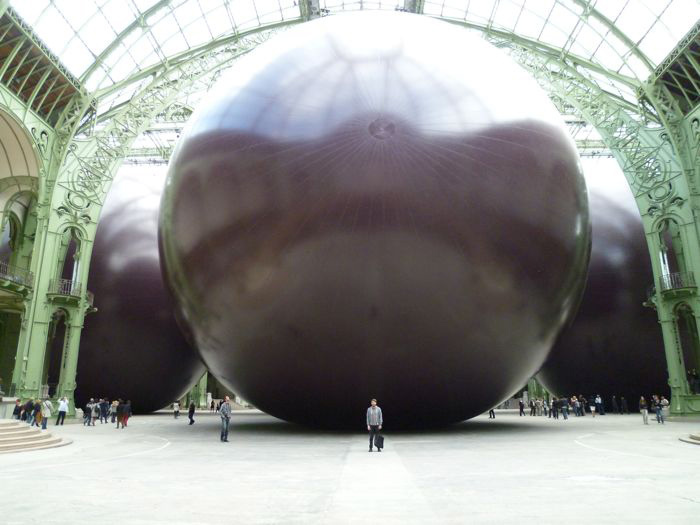 Just got back from Paris and saw an overwhelmingly massive installation by Anish Kapoor at the Grand Palais titled Leviathan. Leviathan seems to stray away from his general use of reflective mirrored surfaces and this time the material is canvas and rubber blown up into three connected balls. The first part of the exhibition enters inside the structure where pinging noises can be heard bouncing around. It’s dark and bloody from the inside, then you are directed outside of the structure and into the Grand Palais where you see the full size and scope of the piece. It is pretty much impossible to describe how large this piece is, but if you happen to be in Paris, the installation is up till the 23rd of June.